IDEMIA, the global leader in augmented identity, has released its new MorphoWave Compact by IDEMIA. The new contactless 3D fingerprint biometric terminal was launched at ISC West, in Las Vegas, in April. The new addition to IDEMIA's range of biometric readers is now available to the South African market. MorphoWave Compact by IDEMIA is a smaller, more versatile version of the hugely successful and award-winning MorphoWave Tower, which revolutionised the biometrics industry with its patented 'touchless' technology. 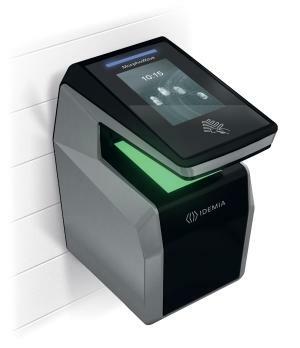 Sales Director at IDEMIA Identity and Security South Africa, Nicolas Garcia, explains that MorphoWave Compact brings the magic of touchless biometrics to new sets of users: "While the Tower has become a game-changer in lobbies, atriums and main entrances at major organisations around the world, it was important to extend this touchless innovation in new directions, to cater for other access control and time and attendance needs." Thanks to its reduced size, MorphoWave Compact by IDEMIA can be easily wall-mounted in almost any location (indoor or outdoor). Users simply swipe their hands over the scanner in either direction, allowing the device to match all four fingers in 3D, ensuring maximum accuracy. Though it is 86% smaller than its big brother, the Tower, the Compact version features the same large scanning volume. "Contactless biometrics is more than just a neat innovation," says Garcia, "it removes many of the operational issues of other biometric readers, mitigating hygiene concerns, leaving no latent prints on the scanner, and easily coping with either dry or wet fingers." The scanner allows for ease of access and quick throughput, making it perfect for high-trafficked areas like busy offices or industrial sites. Due to its cased, enclosed nature, MorphoWave Compact by IDEMIA also neutralises any external environmental factors (such as harsh light, dust or rain). To ensure integration into all other access control systems, MorphoWave Compact by IDEMIA natively supports Prox, iClass, MIFARE, DESFire cards and PIN codes. Other than the primary biometrics scanning capabilities, it's also able to scan QR codes, which is perfect for temporary access and visitor management. It includes a full suite of management features, including the likes of fake finger detection, timed anti-pass back functions, authorised/banned lists, a programmable touchscreen interface, real-time notifications to employees and administrators, and job code management for accurate billing integration. "The most compelling aspect is the absolutely frictionless experience that users enjoy," notes Garcia. "By authenticating you in a split-second, users can remain in motion while being identified. This results in faster, safer access control, reduced overall costs, and increased employee productivity." To find out more about MorphoWave Compact by IDEMIA, please visit www.idemia.com.